Wizard Jam! I'm getting started a little early because there will be several days where I won't be able to cram in any jamming. 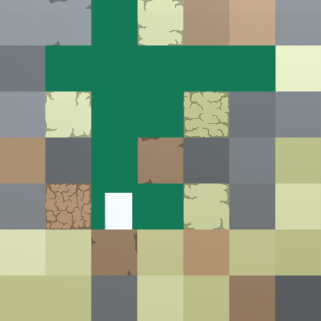 A mining game in the style of Steamworld Dig, the world is made up of blocks, you can mine in 4 directions. Some blocks contain materials - not sure what you're doing with the materials yet, probably plotting the humans'/the robots' downfall. The top of the screen/world has a town where you deposit stuff/refuel/whatever. There also is a Danger Layer which is always visible and is triggered after a certain time. If that layer does not have enough(or not densely packed enough)blocks, it falls down and the Danger Layer moves up. You're gathering materials but at the same time have to avoid turning the ground supporting the town into a swiss cheese. You can spend resources to create scaffolds and such to hold up blocks. - Monsters/enemies/dangers. Might be essential to make things more challenging/fun. I always did find it funny playing games like Motherload, when you could completely hollow out hundreds of feet of earth beneath your starting base with no repercussions. I think Minecraft was the first one to get it right whenever I accidentally drowned or ended up buried alive in gravel. I just started playing Steamworld Dig. There is something very satisfying about mining for resources and resurfacing to sell the goods, buying upgrades, etc, so I'm really looking forward to this game. Danger Layer seems like cool additional mechanic to spice things up. You can wall-jump and stuff. I might still put in ladders but for now this is a fun way of getting back to the surface. Blocks can be destroyed with your cool mining laser - I decided to go with this instead of a close-and-personal pickaxe because it was easier to implement. 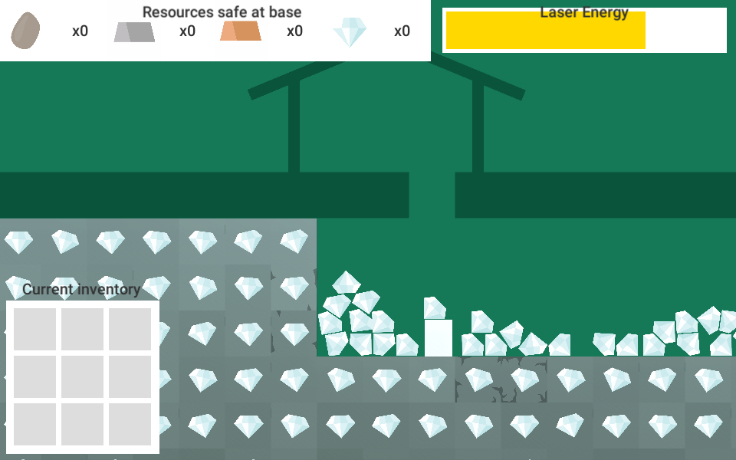 Next are different block types, actual mining and collecting resources...and then the Danger Layer. So rad! The laser reminds me of No Man's Sky, it's a good tool. The Danger Layer could also be a cool place to stick extra valuable resources but risk cave-ins or harmful gas and the like. I'm very interested in this! placeholder graphics withstanding, I can see what you are aiming for. The movement looks fun. Also the particles at the end of the beam add a lot to it. And some beautiful, final, non-functional UI. You can now pick up a limited number of items and deposit them at your base. The laser needs to be recharged at the base(it currently eats through the energy a bit too fast though). Made a simple system for picking blocks based on gradients for each type that determine how common they are at a certain depth. 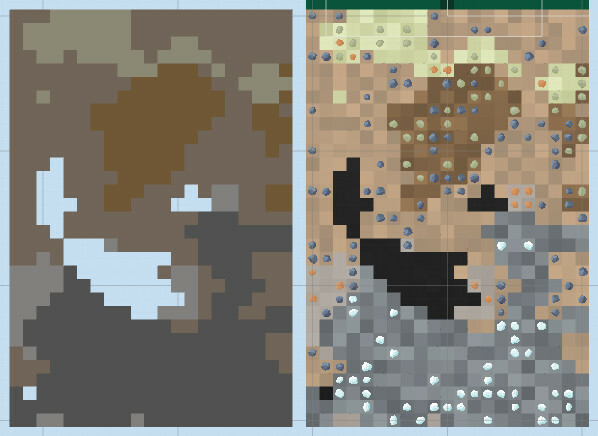 In the screenshot you can see that sand is common at the top and stone at the bottom. I plan to have some sort of cellular automata run over it so it's not quite as noisy. And then there's the placing of minerals in the blocks to figure out. Hey this looks awesome! I'm a big fan of the digging genre. Miner dig deep being a favorite entry. That one in particular greatly mastered keeping the difficulty mired in the digging and traversal itself. No monsters, just the constant fear of falling down a shaft. It also dealt with over-mining by having "cave ins" occur when large open spaces were created. This caused a warning via vibrating and screen shake in the area of the giant cavern. And the cave in itself randomly replaced open tiles with new dirt tiles. In a way this was actually a game balance to keep an area from being un-traverse-able. @plasticflesh I watched that video, and it showed me a few things I still need to figure out - thanks for linking that! For example: how is visibility going to work? Can you just see everything? That seems strange. The laser now has a range and blocks have some debris going on. And now the game generates a background that gets darker as you get further down. 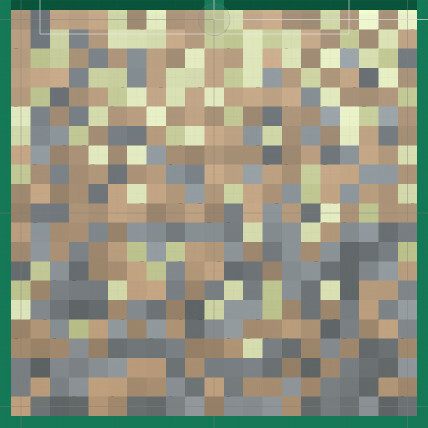 The background isn't actually made up of blocks but a randomly generated texture that's mapped onto a plane as big as the digging area. First implementation of blocks falling. Still need to figure what to do with minerals caught between blocks. They'll probably be crushed(maybe with a small chance of ending up inside the falling block) - not sure how to do that yet. When to trigger the falling, apart from the Danger Layer, is also still a question. Lot's of programming but not much to show. 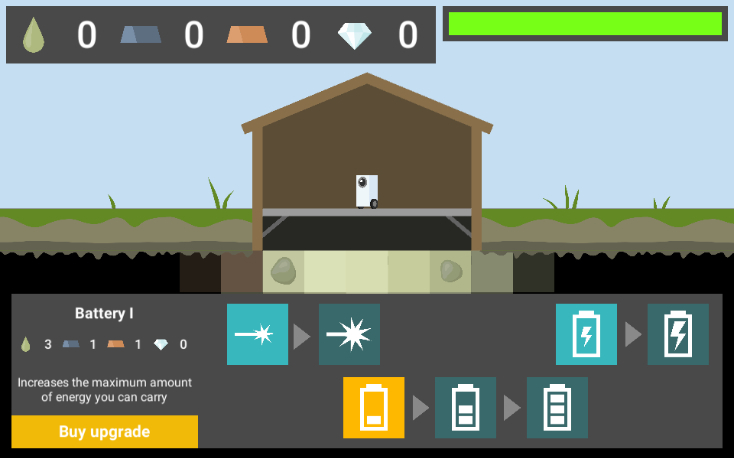 Minerals now appear within a certain range of the player and disappear once you get too far away. Also got a rough system for the "fog of war" underground working(currently it does not reset) - which makes the whole minerals disappearing thing kind of redundant, oops! This game is looking super satisfying to play, and I love the aesthetic. Yup, everything about this seems very pleasing already! I can't wait to try it out! The visibility system is done(?). Not super happy but making this look nice is a low priority right now. Also finished up the system for a better world generation. There's still a whole lot of tweaking to be done but thanks to the system that's very easy to do. the Danger Layer: Hmm? Yes, that thing. Today I refined the map generation a little bit and implemented the mineral spawning. I'd like the ground to be made up of more, smaller patches of materials. I'll have to keep playing with the sliders. Tomorrow: the upgrade system and creating something akin to balance and progression. The last few days had been pretty unproductive, I made a terrible, horrible upgrade system. It's such a bad setup, but at least it works. But yesterday evening and today I finally put in the danger layer. Still got a bunch of items on my TODO list, and I keep adding new ones. Not the way I had planned, but I've submitted the game. It was supposed to be a browser-p layable HTML5 game but Unity messed up the builds, so I went with a standalone, windows only for now. Wrangling the upgrade system into submission was super annoying, that thing is going away as soon as I've polished up the game a bit more. Love the presentation of this, the art and music is both really nice. Gameplay wise I got all the upgrades and enjoyed the platforming around but I feel it's missing the sort of underground hidden cave content you can find in Terraria and Spelunky that can drive the need to explore beyond resources. Also the danger layer implementation is a little weird since there's no really reason for it in fiction, just sort of happens and at the end I just got stuck underground since all the blocks at the top had been destroyed. Have you thought about presenting it as more of a dangerous corruption which could change the terrain but keep the geometry for navigation, like the corruption in Terraria? Great stuff tho, hope you keep working on it! The gameplay loop is as satisfying as I suspected. The minimalistic artstyle works really well. I especially like the particle effects when digging. A very minor thing, but because of the size of the character, it can be quite difficult to jump through one piece high vertical caps sometimes. Very cool. It's kind of like a minimalist Steam World Dig. This feels like a really good project to keep expanding on. But I'll most likely start from scratch and actually plan the systems this time around. @Mythalore Yeah, right now there is just no point to the mining, it just makes you better at mining. Sort of a mining ouroboros. Having some sort of structures to discover underground would be super neat. Building a system that generates more than just smoothed random noise is probably an interesting challenge. The way I ended up implementing the Danger Layer was really lackluster. At that point I had pretty much run out of steam. It wasn't even supposed to just always advance - only when there were enough unstable blocks. The whole stability thing fell by the wayside in general. @Nappi I had noticed that it can be quite fiddly but had no idea what I could change besides the size of the character - to which I was, for whatever reason, quite attached. The movement in general can use some work, it feels pretty jerky right now. Only complaint is I had a few issues with the movement, and got stuck in a hole my first time.